The sky is pretty crowded over Mars right now. India’s Mangalyaan spacecraft is just arrived in Martian orbit this morning, marking India’s first interplanetary object. I don’t have much time for the argument that a developing nation such as India shouldn’t be spending money on space-flight. Science, like art, should be accessible to all people, and to all societies. Developing a functioning scientific infrastructure is, furthermore, a crucial aspect of developing a modern economy. NASA’s MAVEN probe arrived in Martian orbit a few days ago. It will make a few dips into the planet’s atmosphere to study it, with the goal of determining how it was lost over time, turning Mars from a world where liquid water could exist on the surface, to the red desert that exists today. NASA’s MAVEN spacecraft. From Discovery.com. There’s more exciting news pertaining to terrestrial climate change. Sunday was, of course, the global day of action, which saw people marching worldwide (especially in New York City) to demand action on carbon emissions. But the next day was much more interesting, as some very bold protesters in New York flooded Wall Street and held their ground there for a few hours before the police moved in. A few hundred more actions like that, and we might actually spur the powers that be to do something! But at least one power that be did decide to do something: The Rockefeller Family has decided to divest from fossil fuels. This is good news, and it makes me wonder if maybe targetting personalities might be one of the best ways to expand the divestment campaign. 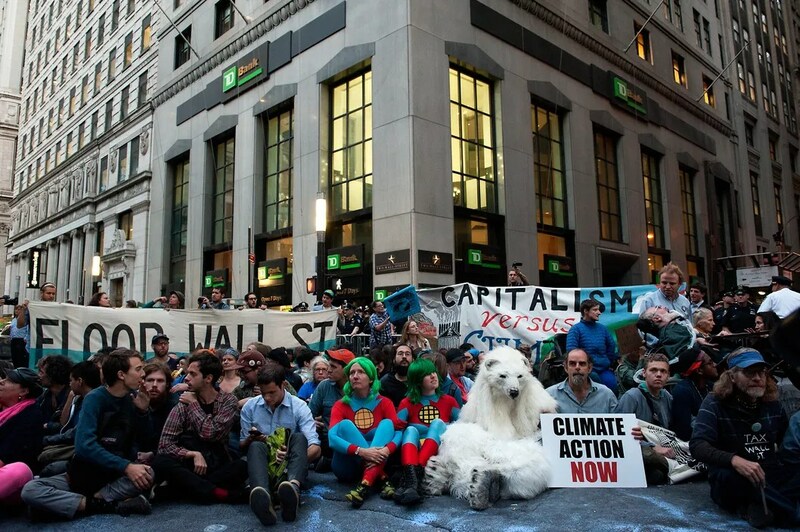 If protesters made an effort to lean on wealthy people and institutions to divest from fossil fuels the same way they leaned on companies like Nike to treat their labour better, then we might make a bit of progress. Either way, I really hope that the Rockefellers do more than just divest. They should take the money they otherwise would have invested in fossil fuels, and use it in a targetted, strategic way to encourage the development and uptake of some kind of alternative. The defection of powerful actors like that could potentially turn a radical innovation into an established system. Lastly, the first rigid airship in quite some time has made its first flight. I don’t think there’s too much to say about the technology at this point other than that I still find it extremely cool. Of course, it’s designed for freight, rather than passengers, so I won’t be able to schedule my around-the-world airship cruise just yet.